I love movies. When I was little, I lived in a small town called Fellows. There wasn't much there. A small market, a post office, a tiny one room library, a diner and of course, a bar. Since our parents wouldn't allow us to hang out at the bar (though Bonnie Nell and I did sneak in a few times to see what the fuss was about), we had to find other forms of entertainment. Back in those days, we only had three t.v. channels. This was before direct TV and cable and TIVO. It was even before VCRs. And, it was rather limiting. So, my Mom would take us over to the bigger town of Taft. There, we could go to the skating rink or bowl at the two lane bowling alley. More often than not, we went to The Fox Theater to see movies. One of my most vivid memories is not about any particular movie I saw. It is about the one I didn't get to see. When "The Jungle Book" came to The Fox, I was really looking forward to it. I already had the record and knew all the lyrics to "Bare Necessities". But when the day came to go into "town", I was sick. My Mom made me stay home. As you can see, over forty years later, I'm still bitter about it. I have fond memories of that old theater. Of popcorn and milk duds. Of sticky floors and red velvet seats. Of a place I could escape to for a little while. Where you could "forget about your worries and your strife". 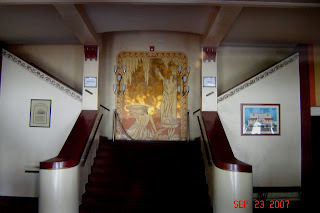 Sadly, many of the great old movie palaces are closing in favor of the huge multiplex cinemas. 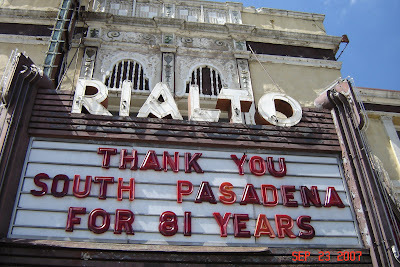 In my new hometown, The Rialto Theater has just closed it's doors. 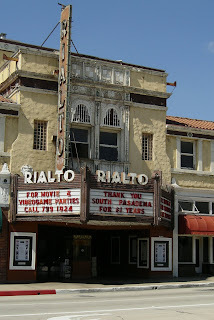 The Rialto opened on October 17, 1925. It was placed on the list of National Register of Historic Landmarks in 1978. It was featured in many films and commercials including Robert Altman's "The Player". It was not the nicest theater around. The seats were uncomfortable. It had a sort of musty smell to it. And, they could never seem to get the temperature right. It was either too hot or too cold. I remember a time when I called the box office to get a showtime, and the recording said the heat wasn't working. They recommended you bring a blanket with you to the theater. Despite all of this, I still liked to see movies there. I am going to miss it as much as I miss "The Fox". Awww!! I am very sad about the Rialto closing!! I didn't see many movies there, but it was a comfortable and familiar place to see as I drove by daily. It was a part of "home".